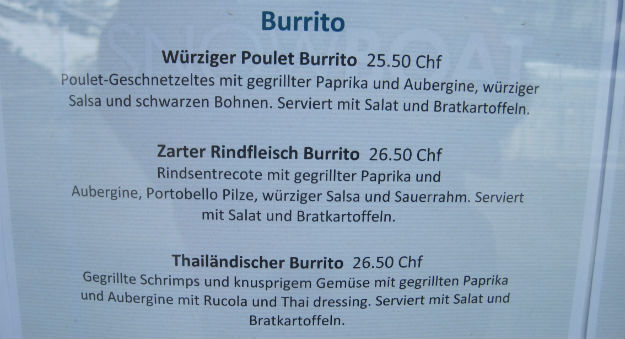 Which is more distressing: the fact that Thai burritos exist or that they cost 26.50 francs ($28.50)? 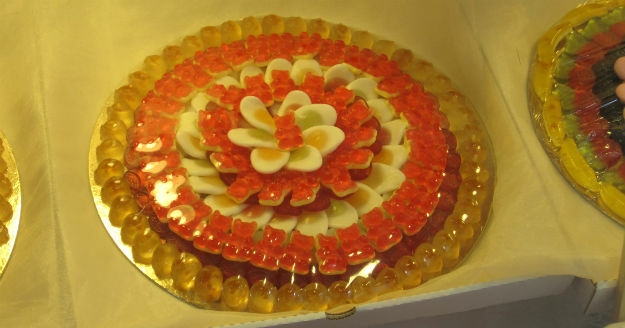 This is my favorite insanely expensive thing in Switzerland out of many, many contenders: gummi bears arranged on a platter. They call this a gummi bear pizza and charge 19.95 francs, or US$21. Four of these cost more than a full-day pass on Zermatt’s mountain trains and ski lifts. Unbelievable. What can be better than living in beautiful Switzerland? To have a job in Switzerland simply means you are on top of the world. My Mexican friends here pay a woman 33 Swiss francs an hour ($35) to clean their apartment and it wasn’t easy to find somebody. That’s all you need to know about how high wages are. Anyone from a poor, relatively poor or even slightly poorer country (which means everyone else in the world) that has become legal to work here has won the lottery. I would feel that way if I was lucky enough to live here. I’m seriously looking into it, and, in fact, I was introduced to one woman who, after only 30 minutes of having met me, proposed that she would get me permission to work in exchange for making her pregnant with my clean-living genes. Should I do it? That’s a nice representation of who is here. I just had an idea. I’ll make a baby with that woman if we can name the kid Tranquillo. Tranquillo Foster…Tranquillo Foster…nah, it’s probably a bad idea. 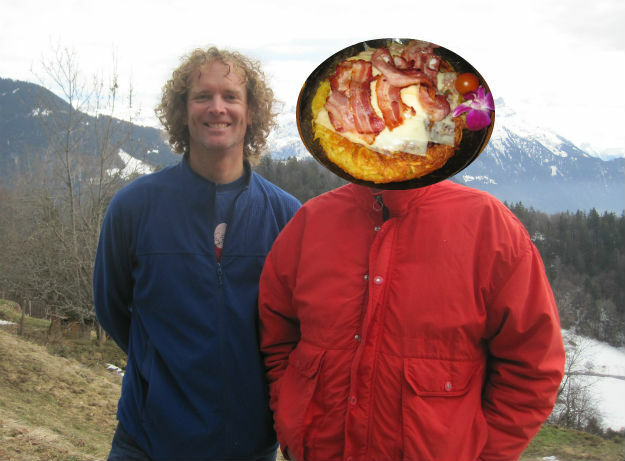 This is me with my friend, Graydon, Master Traveler, in Leysin, and the roesti I ate that night. 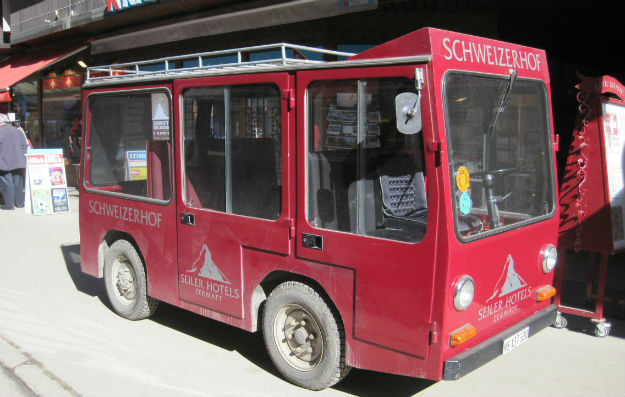 I hitchhiked from Lausanne to Zermatt shockingly easily and even more surprising, the first five rides were from women. The last woman warned me as she pulled over to let me out that I was entering the inbred part of canton Wallis. It just so happened that we were leaving the French-speaking part of the canton and entering the German-speaking part. I chalked this prejudice up to her being French-speaking, but the next guy who took me, well, I don’t like to say anything unkind to someone gracious enough to pick me up hitchhiking, but his teeth were going a few directions. The last stretch of road to Zermatt is closed to non-residents (with a 3500 franc ($3700) fine for trespassers—welcome to Zermatt!) Normally you must take a ten-minute train for $8.50 (In India how many hours could you travel for $8.50? 15? 20?) but I successfully hitched it with a Croatian guy, feeling most triumphant. 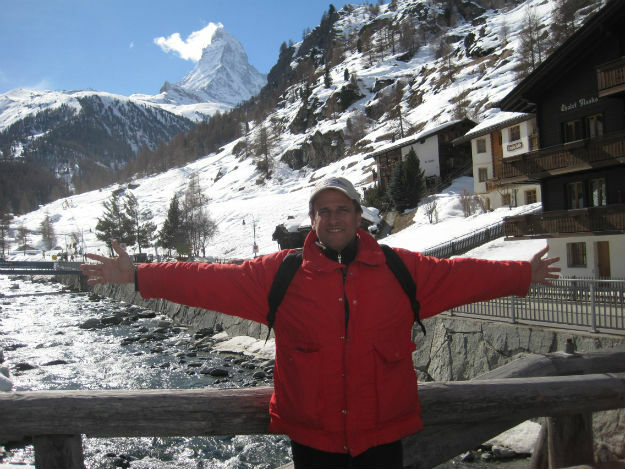 I’ve been in Switzerland countless times, but never to arguably its most famous place, Zermatt, to see the Matterhorn. 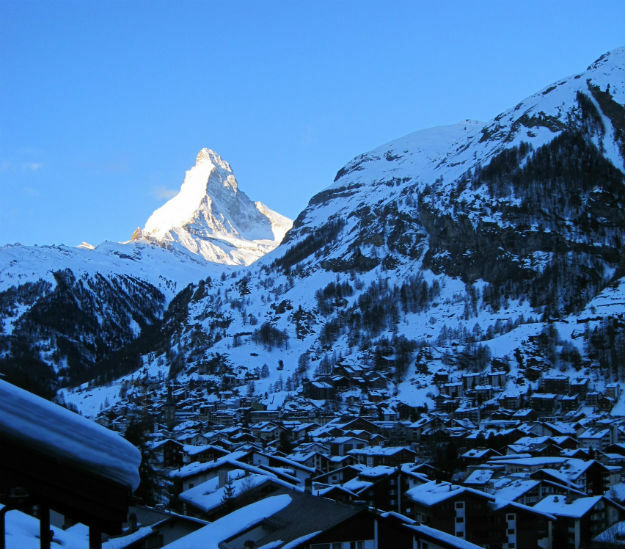 I’ve never been in a place like Zermatt. I thought world-famous ski resort towns weren’t for me, but I had an unexpectedly fantastic time. My good fortune started by being lucky enough to stay with a great Couchsurfing host and my age expertise helped us come in second place in the pub quiz at Sparky’s. There was excellent weather to go on some scenic walks, and for a long while I sat against a weather-ravaged old barn in the sun by a ski run and watched little kids barely a meter tall expertly ski and snowboard down the mountain. I got so caught up in the thrill of being in Zermatt I went into the local government office to ask about the possibility of a North American getting a work visa. I went in with both guns blazing, speaking German, showing my newly-shaved face, the irresistible smile, but I was no match for the young girl there who shot me down with evident satisfaction. “Kein Chance!” she said with force, suppressing more overt hatred. I was going to offer to make babies with her to get a work visa, but I had a hunch the proposal wouldn’t be welcomed. Her loss. This sign strikes me as very Swiss. I should have taken it from farther away as it is in a tunnel in Zermatt and appeared to be unrelated to any danger. It seems to be just a reminder to not come crying to the Swiss for any reason. They don’t have spell-check in Zermatt? Maybe they’d give me a work visa to correct the spelling on English signs before they go to all the trouble of making them. A late entry for most crazy-expensive thing in Switzerland, these electric cars in Zermatt go for $150,000. I hitchhiked from Zermatt to Zurich starting out in -10C (14F) frigidity, very happily taking anything that stopped for any distance downhill. It took seven rides, but only one with a woman this time. One ride was from my doppelganger, if I am using the word correctly. (Doppelganger is one of those German words that need 15 English words to explain. I tell German-speaking people that all Americans know the words schadenfreude, gesundheit (from Bugs Bunny), fahrvergnuegen (from a Volkswagen ad campaign) and doppelganger.) The ride was with a guy who left Switzerland when he was 20 and lived abroad for 27 years. He just came back—and he doesn’t like it. The transition’s been too hard. The last two rides were both with Kosovo Albanians, one who lived one block away from my friend in Zurich and drove me straight there. Cha-ching! Chance encounters with rock stars aside, traveling in oppressively expensive Switzerland can feel miserable. The most depressing times in my traveling life have been in the horrifically high-cost countries of Switzerland, Norway and Japan. It’s not necessarily the country itself because, ironically, they are in the Top 5 countries I’d retire from traveling, but it’s the heightened feeling that you have less options, particularly when it’s cold. It’s not as if I am near homelessness. I have money. Rockefeller here is in the five figures these days, but when I go to the bus stop in Zurich to buy a local ticket and it is 4.20 francs ($4.50), I wither. If you live here, you make plenty enough money to enjoy life, and it seems those lucky foreigners shouldn’t be complaining about Swiss strictness or lack of street life or anything else, but for travelers, $4.50 for a bus ticket is downright Oslo-esque. Norway’s worse because taxes are stratospheric. Here, taxes are low, the Swiss franc is extremely strong—wait, let me dust off my diploma from the University of California at Santa Barbara in Business-Economics before I continue. (My European friends are always surprised to learn that I have a university degree for two reasons: that I sat still for four years to get one and that I don’t use it.) Where was I? Oh—interest rates and inflation are low, and unemployment is 3.1%, which is virtually full employment as anything under 5% means simply that those without jobs don’t want them. The Swiss economy is, if you’ll excuse the heavy jargon used exclusively by us economists, super duper strong, like, top of the food chain, yo! Whoa, whoa, whoa, wait a minute. What’s this all about? 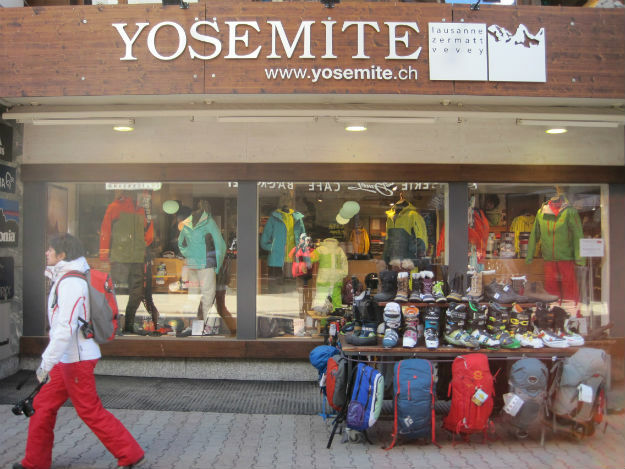 You have to drag the holy name of Yosemite to Zermatt? You can’t be proud of your own nature? As a native Californian, I’m outraged, even more than by Thai burritos. Doesn’t this look fun? Skiing looks fun! Who knew? If you aren’t up for hitchhiking in Switzerland and are petrified of train costs, don’t forget rideshare. My old fave, Mitfahrgelegenheit has a Swiss version. For the French-speaking part of Switzerland, a French website is popular, Covoiturage.fr. I used both this time when it was too cold to hitch and they cost less than half the train fare. I just found your site and have really enjoyed reading your stories. I too have been thinking of travelling and would love to live in switzerland for a bit. My question is how should i go about learning german and french? Can u tell me how u did it? Also if i wish to get a feel of the country where should i go first? Bear in mind, I am not too thrill of the cold as I am currently residing in california. Thanks, Tom! Nothing is free in Alaska? That is disappointing, but it won’t deter me from going there someday. Laray, my German is so-so and my French is awful, but I just make the effort and try to learn a little bit here and there. I studied those languages many years ago in college and high school, but I know any language just by spending enough time there. (I know, maybe not the answer you want to hear!) For traveling you can get by pretty well in English. Switzerland is tiny so you can visit anywhere pretty quickly. I don’t have one favorite place. Maybe check out Interlaken. Great post! Well-written and funny, great pictures (I like Roesti-head Tranquillo Foster) and it’s interesting to see the final version of ideas that I had heard first-hand in embryonic form. By the way, I had never heard the Krokus song. Classic 1980s big-hair metal, although I think I prefer the Motorhead song of the same name. How ironic would it be to discover our favorite frugal traveler blogger settling down in one of the most expensive countries in the world (not to mention friggin’ cold)? I’m glad your happy, Kent! Thanks, Jessica, at least I am someone’s favorite traveler/blogger! I think the secret is to blog once a month. HA! We’ll see if I end up happy if I stop somewhere. Thanks, Graydon, but you know I’m all talk, so we’ll see what transpires. 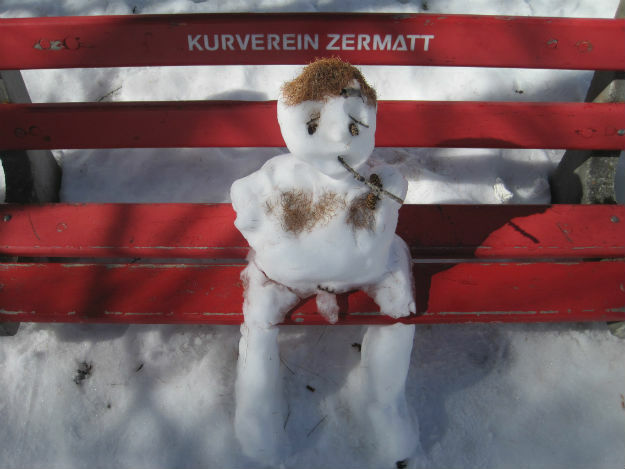 Maybe you can dig through your family free and discover some unexpected swiss ancestry? My gdandma was apparently born in Switzerland, even though she never really lived there. So my dad who is obsessed with mountains thought it would be good to investigate his options and he actually managed to get Swiss nationality for himself, my brother and me! Since then he celebrates Swiss national day every August with flags all over the house and drinks his warery cappuccino out of a swiss flag patterned mug. I think you two should meet! Sorry about the typos. Damn smart phones! Lucky you! I was adopted, so I don’t know what I can invent. (I wonder of that matters?) You don’t need a baby, do you? Hey Kent! We miss the posts! Are you on haitus? Thanks! I miss the posts, too. It’s just too much work. I am in Spain now, maybe I will write something about it. Where you be, Kent? We miss your posts. Hope you’re safe and well-traveled! I be in Spain. I should write something, shouldn’t I? Too much work to even post a funny spanish toilet pic? Could it be Kent is too busy wooing a lovely senorita and has given up on the rest of us? I do have a pic of Real Madrid’s locker room toilet, but can’t decide if it is worth showing. A Spain post is coming! That is the view from MY chalet! I would be smug, too, if it was my view! Are you the guy I stayed with? 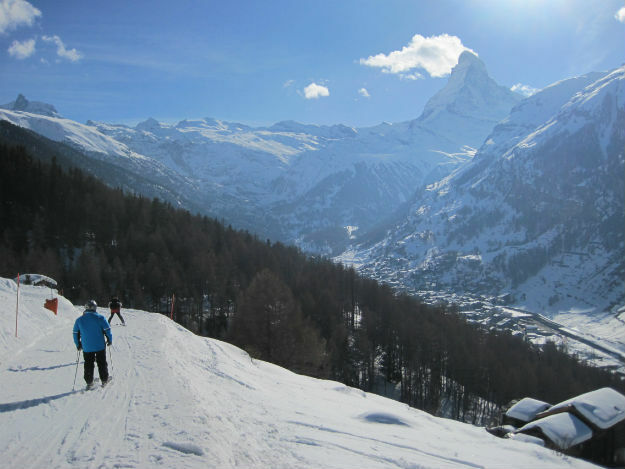 If I win the lottery I may visit Zermatt.